Oklahoma Connection | McPherson was born in Stillwell, Oklahoma. Frank McPherson’s strong concern for quality education placed him in many leadership positions including the Oklahoma Foundation for Excellence, Task Force 200, The Oklahoma City Education Round Table, Education and Business Coalition, and The Foundation for Oklahoma City Public Schools. Oklahoma native Frank A. McPherson graduated from Oklahoma State University and joined Kerr-McGee in early 1957, leaving shortly thereafter to serve as an officer in the U.S. Air Force. He rejoined the company as a petroleum engineer in 1960 and held positions as district engineer, drilling superintendent and production superintendent in the company’s Gulf Coast oil and gas operations (1962-1969). 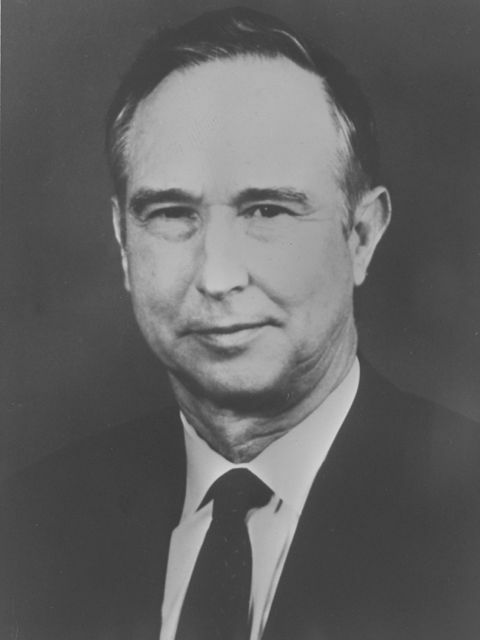 He was named president of Kerr-McGee Coal Corporation in 1973, vice chairman of the board in 1977, became president of the corporation in 1980 and was elected chairman of the board and chief executive officer (1983-1997). McPherson was awarded the Nature Conservancy’s President’s Conservation Achievement Award in 1991 and was honored with the Pathmaker Award from the Greater Oklahoma City Chamber of Commerce and the Oklahoma City-County Historical Society in 1998. See pictures of Frank A. McPherson and other media HERE.